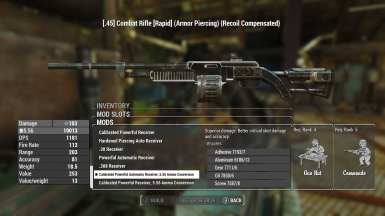 Simple mod that adds two 5.56 ammo receivers and two drum mags to the Combat Rifle. The mods are comparable to the handmade rifle versions. 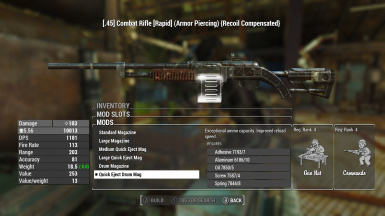 Also adds two 5.56 ammo receivers to the Handmade Rifle. 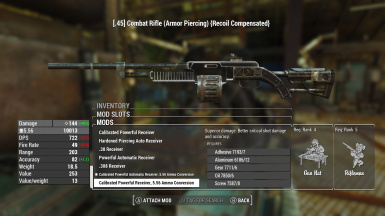 Simple mod that adds two 5.56 ammo receivers and two drum mags to the Combat Rifle. 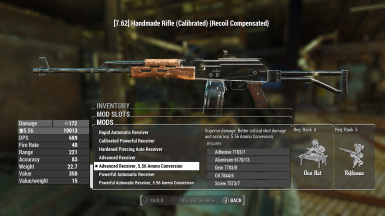 The mods are comparable to the handmade rifle powerful automatic and advanced receivers. 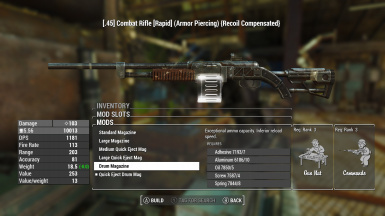 The drum magazines are also comparable to the Handmade Rifle's. 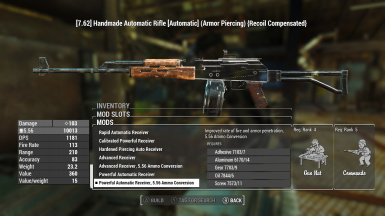 Also adds two 5.56 ammo receivers to the Handmade Rifle. The perks are similar as well. After using the Handmade rifle I wanted something equivalent that used the 5.56 ammo that I wasn't using. The water cooled MG didn't match my character. Pics shown are from a level 291 character with almost all the perks.